A delicious shrimp meal is quick and easy! Crisp, succulent shrimp. Perfectly al dente fettuccine. Rich, creamy Alfredo sauce made with real grated Parmesan cheese. This Italian seafood classic is richer and easier than ever delivered to your door. - it arrives ready for the microwave or oven straight from your freezer. Meal serves 2 - 4. Preparation: Do Not Thaw!�Microwave (1100-WATT): Remove tray from box and place tray in microwave with film intact. Heat on high for 4 minutes. Peel back film; stir, replace film. Heat on high for 2-3 minutes or to an internal temperature of 165�F. Remove film and stir. Let stand 2-3 minutes before serving.�Bake: Preheat oven to 400�F. Remove plastic film from tray and place tray on baking sheet. Cover tray with foil. Place baking sheet on oven center rack and heat for 30 minutes. Remove foil covering tray, stir well and place back in oven for an additional 5-10 minutes or to an internal temperature of 165�F. Remove from oven, stir and serve. 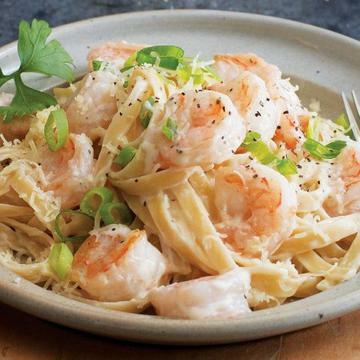 Ingredients: Ingredients: Water, Enriched Fettuccine (Semolina (Wheat), Niacin, Iron (Ferrous Sulfate), Thiamin Mononitrate, Riboflavin, And Folic Acid), Raw Shrimp (Shrimp, Salt, Sodium Tripolyphosphate (To Retain Moisture)), Half & Half Cream (Milk, Cream, Disodium Phosphate, Sodium Citrate), Parmesan Cheese (Pasteurized Part Skim Milk, Cheese Cultures, Salt, Enzymes), Margarine (Soybean Oil, Palm Oil, Water, Salt, Mono And Diglycerides, Soybean Lecithin (Soy), Natural Butter Flavor, Colored With Annatto. Vitamin A Palmitate Added), Modified Corn Starch, Whole Milk Powder, Salt, Crushed Garlic, Spices. Contains: Wheat, Shrimp, Milk, Soy. Shrimp Contains Sulfites.